Recently, peached tortilla founder Eric Silverstein sat down on the Haymakers forum to discuss all things mobile. 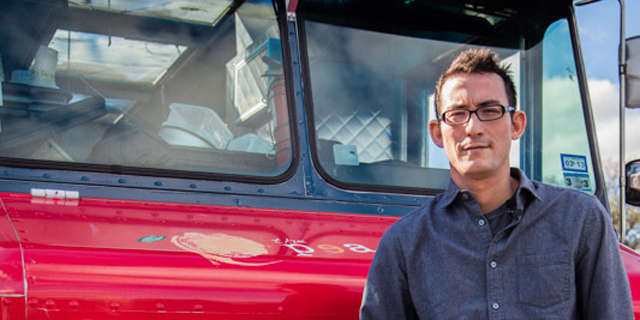 During his chat, he touched on start-up advice for future food truck entrepreneurs, the toughest challenges about the mobile food business, and whether he plans to take the peached tortilla to a brick and mortar location. Eric: Hey everyone, I am online and ready to talk mobile food! It has been another hectic day in the mobile food world but I am glad to be a part of this conversation. Robert Mulyano: Hi Eric, been following both the peached tortilla and Yume for a while now. Do you ever consider taking the business to brick-and-mortar route? Eric: we are definitely considering taking the business brick and mortar. I believe that is the natural progression for us. I’m not sure we have a ton left to prove in the mobile world and quite frankly, it is a very challenging business to run from an operational perspective. I am hoping that in the next 6-9 months we can transition into a brick and mortar capacity while still offering the mobile platform for our catering clients. Haymakers: I’m going to ask the burning question on everyone’s mind–where’d you come up with the name the peached tortilla? Eric: Well, well, that is a burning question. I grew up in Georgia, the “peach” state. Since our food is inspired by what I grew up eating, I wanted the name to tie back to my experience and time in the South. I also wanted the name to be playful. Using the word “peached” allows us to define our own concept. Within the company, getting “peached” means being flavorsmitten with the food, but it can really mean anything for our customers. The key for us was developing a name and brand that was unique and that people would remember. Our food is fun and innovative and we hope our name is too. Haymakers: Flavorsmitten!!!! That word is *mine* now. Alison Root Meyer: Can you tell me some places where mobile food really seems to be taking off? I live near New York and have noticed a lot more variety in mobile food in the past few years. Thanks! Eric: Hey Alison, I think mobile has always had a place on the coasts in New York and Los Angeles. Other metropolitan cities like Chicago are really struggling, not just due to weather but also permitting issues and restrictions imposed by the city itself. You are starting to see secondary cities really delve into the mobile scene. Places like Miami, St. Louis and Atlanta have had growing mobile scenes. I moved to Austin from St. Louis, and there were zero trucks when I moved out in 2010. Now there are plenty of mobile trucks in St. Louis, and even some that have gone brick and mortar. There are also cities that are a little over saturated with mobile food: Portland, and even Austin to an extent, come to mind. Adrienne Lowentein: Thanks for leading this Q&A, Eric! What unexpected expenses have you had to deal with? Eric: You always want to save for a rainy day in this business (no pun intended). Recently, we lost our windshield wipers because they flew off in a thunderstorm. We have small dents on the truck that need to get fixed here and there. There are always additional expenses that come up, the majority of which are related to the truck itself. The biggest unexpected expenses have come in that department. If I were going into the business for the first time again, I would have budgeted more of a marketing budget. Just because you are a food truck and use social media does not mean people will automatically know about you or come and find you. You need to actively get the word out about your product and sometimes, even via social media platforms, that takes money. Haymakers: Considering all the variables with weather, etc, what opportunities are there for “bread and butter” steady income with a mobile food business? Eric: “Bread and butter” business in the food industry = catering. It’s almost a mathematical equation. The lunches and day-to-day operations are nice; however, to make legitimate money in mobile food, you need to lower your food and labor costs and increase your bottom line margins. The real way to do that is through consistent catering clients. Our top clients include marketing & PR companies, event management companies, car dealerships, and brides. Our clients really do span a large range. Robert Mulyano: You have a lot of Asian influence in your menu items. I’ve also noticed that even when you’re expanding your menu, this influence stays (eg. the Hawaiian pork belly, fried risotto balls etc). How did you arrive at that – putting Asian-themed flavors if you will? Do you see and/or anticipate any additional menu influences down the road – either from regional or specific techniques? Eric: Our menu is, to an extent, a function of our kitchen. Since we lease space, we are confined to cooking methodologies and techniques that our kitchen can provide. We braise our meats, and this has probably been our most-used technique. We have really focused on creating great dry rubs and braising liquids so that our proteins (brisket and pork) taste great. As for the Asian-themed foods, those are a result of my upbringing. I was born and raised in Tokyo. My mom is Chinese. I have traveled all over Asia including Korea, Hong Kong, Singapore, Bali, etc. The food in Asia is so different and it really shaped what I loved to eat at an early age. I am passionate about Asian food. It’s what I eat at home. I wanted to make it a part of our business; I would not want to be involved in producing and selling food I am not passionate about. Rachel: Hi Eric! At Food Sol at Babson College we see lots of young food entrepreneurs entering or already in the food truck space. What common pitfalls do you see in mobile food time after time? Any boilerplate starter advice you’d offer to these entrepreneurs? Thanks. Eric: If I had to pick out the “best” mobile food entrepreneur, it’s someone extremely driven who is willing to do all the dirty work. That person must come in with substantial operating capital. It takes more than $10,000 to get your business off the ground. I would recommend starting capital in excess of $70,000 if you lease a truck and in excess of $140,000 if you purchase a truck. I would also advise a new operator to have an operating partner involved in the day-to-day business. It is extremely difficult to run these trucks as a one-man show. A new operator will need the support of a partner and a team. Finally, new operators almost always fail to market. Mobile food is extremely hard. I have only seen a few operators in Austin that have really impressed me. My friend Jae Kim from Chi’Lantro is a tremendous operator. He did it by building a great team. It’s doable, just very difficult. Emily Harrold: Hi Eric – How do you decide where to park your food truck? How do you balance joining the crowd versus having your own space? Thanks for chatting today! Eric: In Austin, there’s not so much picking and choosing. Parking your truck on a private lot has almost gotten to the point where it is no longer is affordable. Is it worth $1,500 to park my mobile truck at one spot three times a week? Maybe. Maybe not. You need to understand your brand, your target market, and who you are trying to cater to. Every truck is different. Even bars in Austin are driving up the prices for parking in their space. For us, we try to stay away from high rent scenarios. We try to limit our overhead and go to locations where our food is needed. We also focus heavily on private events, which are much higher margin. Mike Galante: Hey Eric! From your perspective, now with two peached trucks, do you see any scalability benefits when you go from one to multiple trucks? You said it’s natural for you guys to be looking at the brick & mortar direction, but then there’s Chi’lantro and Short Bus Subs who are rolling out fleets of trucks. Does it get to the point where having a small army of trucks makes it easier? Or does it just add more layers of complexity? Eric: Mike, that is a fantastic question. There are definitely scalability benefits. You can spread the cost out of your kitchen, insurance, etc. over your fleet of trucks rather than just having your one unit absorb everything. You can also afford to hire a GM to oversee your operations. So yes, from an overhead perspective, you are reducing costs and the growth model provides you with more flexibility. However, with more trucks, you are increasing staff and the overall complexity of the business. The business becomes more difficult to manage. Also, the probability of accidents, mechanical problems, etc. will grow. There are also natural growth problems when you scale. You have to maintain food quality and consistency, which is challenging with multiple spots. Haymakers: Do you ever take the truck on the road to other cities–what are the permitting/licensing logistics of that? Are there any benefits for doing so in establishing a brand or following? Eric: Yes, we have taken our truck on the road, but I question the overall benefits unless you are trying to grow a national food truck brand. We took our truck to Dallas and it was marginally worthwhile from a financial perspective. As for permitting, virtually any major city offers a temporary health permit that you can pull for a marginal fee. That permit allows you to operate in the city for that day. The health inspector will come out and look at your truck. Keep in mind, these trucks are not built for four hours drives across Texas. They are barely built for the everyday wear and tear we put on them within Austin. There are also significant operational expenses in traveling long distances to serve food. You need to rent refrigerator trucks and pay for your employees to drive and stay in hotels. Bekah Powell: Hi, Eric! So great of you to answer these questions. I have some friends who are looking into opening a Snap Kitchen-esque place in a shipping container, so it would be food-truck-esque. Do you have a sense for any other niche opportunities in the mobile food landscape? Eric: Hey Bekah! I think there are niche opportunities for carts. I am good friends with Jon Notarthomas who owns Best Wurst and I am constantly in awe of his business model. I also think there are “micro-kiosk” opportunities in mobile food, where you can move your kiosk from place to place. I’m not a huge fan of stationary locations a la trailers due to the oversaturation of the market in Austin. I’m not sure there are niche opportunities in terms of “concepts,” but absolutely in terms of the methods and operations utilized. Jae Kim: Thanks Eric, this forum is very helpful to food truck entrepreneurs! Jae Kim: You work all the time, when do you sleep Eric? Eric: I do not sleep. I like my competition to know that when they are sleeping I am working. Like Floyd Mayweather. Jennifer Glasgow: I need help building a team so I’m *not* working all the time …. any tips on how you built such an awesome team for PT? Eric: It is not easy building a team. Try to start from the ground and build up. If you can have one successful team member, usually that person has other great friends that can be assets to the company as employees. Haymakers: What traits/skills/abilities do you look for in your potential mobile food team members? Eric: We try to hire team members that have great energy. If somebody smiles a lot and makes me feel warm when I interview them, then the customer will likely get the same experience as well. I try to see if potential team members are loyal. I dislike resumes of people who have moved from job to job consistently, month after month. I have been burned by these type of employees in the past. Hiring is a very inexact science. I know Danny Meyer has a seven-trait hiring methodology, but that seems very difficult to implement in my eyes. Neal Kohl: How much local sourcing do you do? Wish you could do? And what are the limitations? Thanks for your insights, Eric! Eric: Neal, another great question. We try to source as locally as possible to the extent are prices allow for it. We purchase our burger meat at Johnny G’s Meat Market. We purchase our slider and hamburger buns at Sweetish Hill Bakery. We do make an effort to use local vendors. However, it is unrealistic for us to source the majority of our proteins locally at the prices we have on the truck. I would love to use Richardson Farms pork belly all the time. It is a great product. However, we would have to charge $4-5 for the taco. I’m not sure consumers would be willing to pay it. It’s a fine line to walk. We try to make sure that there is integrity to product by way of preparation. We make all of our sauces in house, braise our meats in house, etc. Haymakers: How do you determine pricing? Eric: We determine pricing based on food costs and also what the market will pay. Since we do a large lunch business, our prices need to be amenable to the lunch crowd. We have been forced to raise prices over the past three years mainly because the cost of food keeps going up. Particularly the price of our proteins like brisket and pork belly. Adrienne Lowenstein What is the mobile food community like? Friendly/collaborative? Or competitive? Eric: It’s tough to say. I think it’s a mixed bag and is really dependent based on the operator. I really do believe there are strength in numbers, that’s why I created Trailer Food Tuesdays. I don’t think we would draw the crowds we do without having so much variety out there. Generally speaking though, I think most trucks and trailers stick to themselves and try to gut it out on their own. Robert Mulyano: To follow up on Adrienne’s question, any jerks who you can’t stand? WE WANT NAMES! Eric: PLENTY! But I don’t want to air anybody’s dirty laundry. We’ll grab lunch one day and I’ll spill the beans. Eric: Thank you all for joining the chat! And best of luck with your mobile food endeavors!!!! Haymakers: Thank YOU–awesome info, Eric!